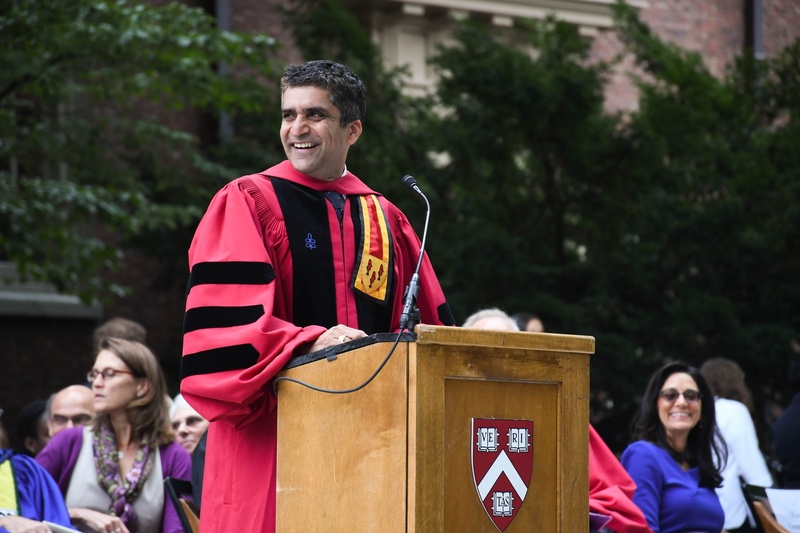 Dean of the College Rakesh Khurana speaks at Freshman Convocation in 2017. On Friday, Khurana spoke at the Midyear Graduates Recognition Ceremony. Dozens of soon-to-be College graduates capped off their last semester with the Midyear Graduates Recognition Ceremony at the Student Organization Center at Hilles. The ceremony provides students graduating after the fall semester, rather than in the spring, an opportunity to celebrate their achievement with their families. Organized by the 2019 Class Committee and the Harvard Alumni Association, the event featured several speakers and a reception for the 118 midyear graduates, and their families and friends. 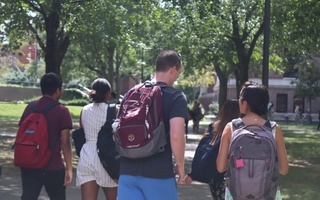 Some students are graduating a semester early after already fulfilling academic requirements, but most midyear graduates have taken a semester or more away from campus. Julia E. Canick ’17-’19 said during her speech at the ceremony that student reasons for taking time off vary, but ultimately aren’t important. Canick said she had taken three semesters off due to health issues. Canick said that leaving the College for a semester and deciding to return can both be difficult choices, especially at Harvard. “We took time away from an environment that often seems to emphasize being ‘on-track’, and we returned when we weren’t on said ‘track’,” Canick said. During his remarks, Dean of the College Rakesh Khurana said that he himself graduated off-cycle from Cornell as an undergraduate, reflecting on the impact that the decision had on his life. “December graduates, I feel a particularly special bond with you because I too was a December graduate. It was not something I had planned when I started college, but it actually turned out to be the best thing that ever happened to me,” Khurana said. “Without these moments of serendipity, we risk leading lives that are extremely efficient but monstrously dull, because it is those unexpected moments that makes life both messy and majestic,” Khurana added. Speakers often touched on the stigma surrounding “off-cycle” students, and each time the friends and family in attendance were quick to show their support with laughs and loud cheers. Midyear graduate Eehjoon Kwon ’18-’19 was excited to finish her studies and said she wasn’t expecting so many other students to be graduating in the fall. Still, Kwon says she feels “not completely graduated yet” — she and her fellow graduates still have final exams to take before the semester’s end. “I didn’t know there were going to be this many other people off-cycle like me, and it’s really great to hear that I’m not alone,” Kwon said.